Q. 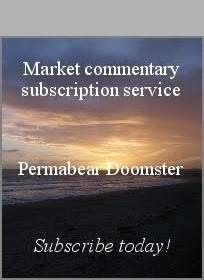 What is the 'Permabear Doomster' blog about? This blog's primary aim is to help contribute 'something useful' to the wider chartists-community. Having been lurking in the shadows for over 3 years (2008-11), I felt it was the right time (February 2012) to begin my own regular postings. Q. Who is the 'Permabear Doomster'? 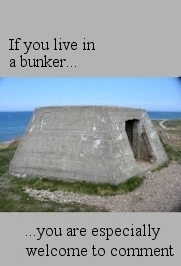 I'm just another trader out there in the western world (London, UK, who currently resides in an overground Bunker. I have extensive experience in trading stocks, ETFs, and (stock, ETF) options. Ohh..and no, I'm not a 'qualified financial adviser', although I find it shamefully ironic that most of those 'experts' never saw any of the big declines coming. It was always 'such a surprise'..how could 'they have known?'. Q. How may I contact the Permabear? You are most welcome to post any general comment in any recent posting, via a Disqus account.